For many years, there have been many obstacles on the way to the development of the telecommunications sector in Nepal. The mountainous terrain of the country extremely hampered the expansion of the telecommunications structure. Unfavorable economic situation and political instability negatively impacted the country. Despite this, the penetration rate of cellular communication in the country is steadily growing, today it is 106%. 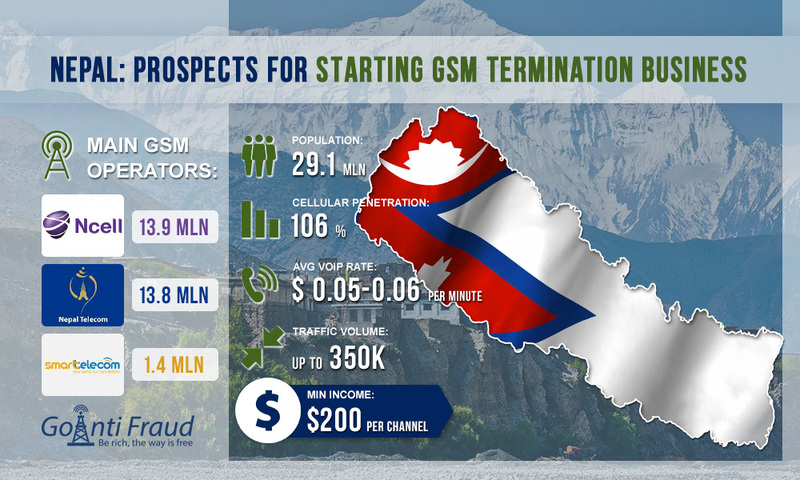 With an average rate of $0.05 - $0.06 per minute, entrepreneurs are given the opportunity to run a stable business terminating the GSM traffic in Nepal. The mobile market of the country is relatively mature and it continues to grow moderately fast. If in 2014 the level of cellular penetration was 82%, then in 2016 it crossed the 100% threshold, with the population of Nepal of 29.1 million. Experts predict growth to 110% by 2020. Nepal provides much international traffic due to a well-developed tourism. In Nepal, there are 8 of the ten highest mountains that attract mountaineers, and the Buddhist heritage also attracts foreigners. Tourism is the largest industry in Nepal and a major source of income. Therefore, it is not surprising that the originators offer up to 350,000 minutes to terminate in this country. Smart Telecom (1.4 million subscribers). The cost of the starting package in Nepal is about $1, while the operators immediately grant a bonus of 25-50 cents to the account. On average, the minute of a local call costs about $0.02. Accordingly, the terminator can make $200 via one channel. Connect to GoAntiFraud to make more money doing call termination. We offer efficient tools to circumvent AntiFraud systems, which can significantly reduce business costs. You are interested in investing in the GSM termination business but do not know where to start? In our Study Center, you will find educational materials, including articles about termination in different countries, video clips, Case Study, goip 4 manual, etc. Are you going to start a VoIP GSM termination business? We bring to your attention GoAntiFraud video materials which contains information about VoIP technologies and the capabilities the service has to offer. Step-by-step video instructions will help you understand what GSM traffic termination is and how to start a profitable business in this area. Do not forget to subscribe to our YouTube channel so that you can always use helpful video materials at any time!